Find out how learning to teach yoga in beautiful Chiang Mai is going. Today we're bringing you Part 2 of our three-part series that follows our trainees along their journey through the first Namaslay® Yoga Teacher Training. If you remember, in Part 1 we checked in with the YBC® YTT as they were preparing for their intensive training and their upcoming travel to Chiang Mai, Thailand. Now that they're halfway through, we're revisiting the same nine students to find out what aspects of the training they're loving about YTT, what they're missing most from home, and what they wished they had spent less time worrying about prior to coming. First, my impression of our training. Whew, this is a tremendous undertaking! I feel like a mama bird so worried about her little chicks! The days are really long and the nights feel super short. Their days start at 5:30am and we go pretty much until 8:30pm daily. This intensive training is, in fact, quite intense. But I'm loving it. I am loving watching them grow and learn and be inquisitive. I'm loving being around such passionate, likeminded teachers, and I myself am learning so much from all the talented teachers we've invited on board this training. I also love seeing the days from the students' perspective in the Instagram Story takeovers - as that's part of their media training project. All of this makes me so excited for our Tennessee training which is coming right up! 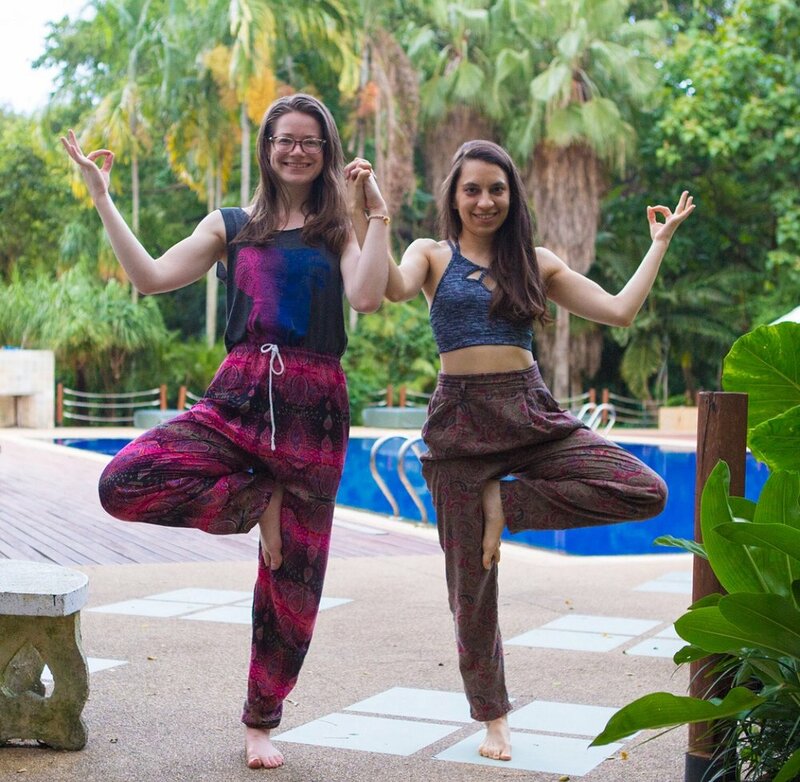 Check out all of our upcoming Namaslay Yoga Teacher Training and Yoga Retreats and let us know if you can relate to where the YTT are in their training and if you have any advice for them pushing through to the end! PS - Don't forget to follow their entire journey at @NamaslayYTT. I’m missing this familiarity of my home life. As much as I couldn’t wait to get away from the same old same prior, I can’t wait to get back home after training. My strategy for dealing with it is reminding myself that it’s only 3 weeks long. In the grand scheme of things that's really not that long at all. So, just focusing on being present and taking it all in while I’m here. And luckily we have WIFI to keep in touch. I wasn’t prepared for how many emotions would come bubbling to the surface. I’ve been a hot mess. 3. What do you think has been the most informative aspect of this training? I’ve really been enjoying the business aspect of the training. I don't know of any other YTT's offering that component, which is kind of funny because it’s really necessary in order to make a career out of yoga. Holy Hell this is NO JOKE. One of the coolest and hardest things I've ever done in my life. The teachers all have so much knowledge, and insight to share with us, I’m just trying to soak it all up. 2. What's your overall impression of Namaslay® YTT so far? 4. Looking back on your travel to Thailand, is there any preparation you would've done differently? Packed deodorant in my carry on!!!!!!!!! Hahaha I STUNK after the 15 hour flight. & then all the stores in the airport were closed during my layover. It was the worst! Never again! Food! We’re on a vegetarian meal plan here, and I’m such a picky eater it’s been a struggle. Room service and coffee from the cafe help! 2. What has been your favorite aspect of the training so far? The personal development! I absolutely love the daily journaling prompts and moments of self discovery. Svadhyaya! 3. Do you wish you spent more time preparing for anything? I wish I had taken the time to learn some of the Thai language. It’s so comprehensive! I really feel like I’ll leave here feeling prepared and ready to teach. 1. What's your overall impression of Namaslay® YTT so far? I am grateful for the time, energy, and care the YBC team and the Namaslay teachers have dedicated to making this experience so valuable. I know I am getting so much more than the average 200hr YTT curriculum would offer, and I’m excited to see what else is in store for us! I’ve already learned a ton. 2. Did you spend any time worrying or analyzing something before arriving, that now that you're here, doesn't seem to matter? I worried about my physical ability and the strength classes, but that was such a waste of energy! I am more than capable, and I really look forward to the opportunity to celebrate my strength in our workouts and asana practices. Besides, the point is just to find what feels good. I wish I had been more open about this experience before I started the training. Who knows what I might have learned or what opportunities may have come my way had I been confident enough to share my excitement about becoming a yoga teacher sooner? 4. What has been your favorite aspect of the training so far? My favorite aspect has been connecting with so many amazing people. Everyone is encouraging and uplifting, and we each have a unique perspective to bring to the table. It’s so empowering when we come together in support of one another. 1. What do you think has been the most informative aspect of this training? The reason why certain poses effect us in certain ways - physically and mentally. Candace’s personal stories, experiences, struggles and tips It’s incredible helpful, motivating and mind calming to have someone who has already set up a business, gone through this whole journey and is still on her way up! It’s extremely intense but an incredible challenge to figure personal things out as well as a wonderful journey to ourself. 1. Did you spend any time worrying or analyzing something before arriving, that now that you're here, doesn't seem to matter? The thing I worried most about was that I was not good enough, that everyone around me would be LOADS better and wonder why I had come. But, while there are people here who can do much more advanced postures than I can currently, I am thrilled at the opportunity to get to know everyone. My favorite part has been the collaboration between fellow students and instructors. The most informative aspect has been the quality of all the instruction and the depth of insight the various instructors provide. 4. What has surprised you most about YBC® YTT? I have been blown away by how thorough and comprehensive the training has been. 1. What has been your favorite aspect of the training so far? Due to my background as a massage therapist, I love how the anatomy teachings are explained with relevance to correct alignment of yoga poses, and the sequence of poses in a class setting. 2. What do you think has been the most informative aspect of this training? I really appreciate the business sessions. Trainees at Namaslay YTT get thoroughly prepared to practice as a yoga teacher and also earn money. 3. What has surprised you most about YBC® YTT? I was expecting great things, but the content presented in this training has exceeded my expectations. I love the variety of topics, and depth of knowledge of the teachers. It’s definitely a well rounded program. 4. What are you missing most from home and what strategy are you using to help? I miss my loved ones, and I use internet based apps to communicate with them every other day or so. It makes me feel good to hear their voices and get encouragement from them. I'm missing my Canadian trees because it reminds me of summer time with my family and easier childhood days when my dad would take us all up north on holidays. The sounds, smells, and even the wind is really different here (we've meditated enough times now in the early mornings for me to pick up on this!). Everyone is sooo warm and supportive. I forget that we have all come from different areas around the world! I typically find it hard to really open up to others but I don't really have that same issue here. It's really nice! Oh and obviously no surprise here, but Candace is totally super cool...she's there for you day and night which is amazing. 3. What has been your favorite aspect of the training so far? Two things...first, the silent mornings where we practice mediation and yoga (I teared up every morning for the first few days because silence just brings out so many emotions) so I've learned A LOT about myself through this and secondly, the business classes! I just get so excited about all the possibilities! This has been one of the BEST decisions that I could have made for myself up to this point. Although super tough, this training is seriously so well put together. Yogic philosophy. We did presentations on the 8 Limbs of Yoga, and hearing the ancient ideas applied to real life “on the mat” and “off the mat”, was amazing. It not only helped everyone connect, but self analyze how these things apply to our lives. Morning meditation and yoga followed by silent breakfast and journaling. I wish I had all the poses and Sanskrit written out already. And then filled in the cues I prefer as we’ve learned them. Feeling a tad behind in learning the postures in Sanskrit. 4. What has been discouraging about YBC® YTT, if anything? A lot more anatomy than I expected and no lectures on gut health yet.